This morning was nice........I slept in, made breakfast, and we have big plans to decorate our Christmas tree this afternoon. I always love decorating the tree with my hubby. We have so many memories with our ornaments from the past 15 years, and I just love reminising with him. November 14 – I am thankful that our home is filled with laughter. I adore my husband, and I love that we laugh often, enjoy the life we are living, and that the Lord has given us each other to travel this journey called life with each day. November 15 - I am thankful that my family is only two (2) hours away. There are many days, I wish my parents and in-laws lived down the street; however, I am thankful we are only a few hours away. The drive home is only a short drive, and its one of my favorite drives because its so beautiful and I know what is at the end of the drive.......unconditional love!! November 16 - I am thankful for my small group. This fall the Lord blessed Matt and I by surrounding us with an incredible group of friends in a "small group" at church. We enjoy spending time with them, and look forward to all the incredible memories ahead next year. November 17 - I am thankful for this blog, to keep up with my close friends and family. November 18 - I am thankful for my education, and the incredible relationships I still have with my college friends and sorority sisters. I was so fortunate to attend college at the University of Tennessee, and my time there was some of the best years. My sorority, student government, and volunteer days were amazing. And, it didn't hurt that our football team won a national championship and top contenders for the title each year. November 19 I am thankful that I can give back. I LOVE volunteering. I LOVE making a difference, and serving other people. From volunteering to serve the homeless in their church, to ringing bells for the Salvation Army, to helping with civic and business organizations, I just adore being around others and making a difference. And, I am thankful that the Lord has given me health and the ability to serve in so many way. Thank you, Lord. November 20 - I am thankful that this week kicks off the holiday season, and I get to spend some much needed time with my family and close friends. I need some "home" time. I haven't been home for a visit since July, so I am longing for some time with friends. Great list. 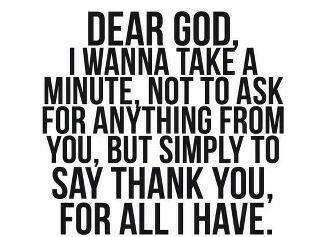 It's always easy to forget the "small" stuff we are thankful for! Have a great Thanksgivng week. Thanks, hope you have a great week too! !